A common criticism of the iDevices is that they won't play Flash based web-sites. You may have noticed this when you browsed over to a favorite educational site on your iPad, only to find the following message: "To view our website, you need the latest version of Flash. Upgrade now to Flash 9". When you go to update, you are then plagued with this message: "We're sorry, this content requires Adobe Flash Player, which is not supported by your device." The late Steve Jobs was not a fan of, and he criticized Flash security, performance, battery life and reliability. Adobe and Apple just haven't gotten along well. Still. There are terrific sites that we'd love to access on our iPads with students. 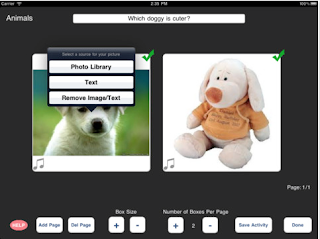 For example: Tarhill Reader for some great read-alouds, Priory Woods for a wide array of "cause & effect" switch activities and more read-alouds, or Bitesize for English, Math, and Science for all grade levels. 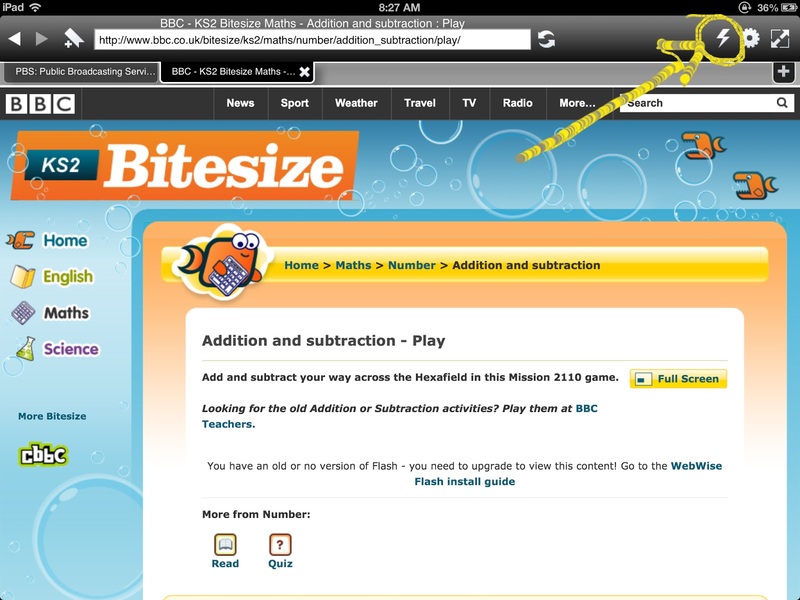 There are a handful of work-around apps that allow you to run Flash based web-site on your iPad. 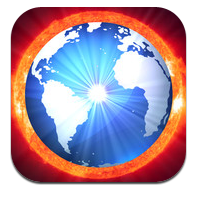 My favorite to date is Appsverse Photon Browser. It sells for $4.99, and works on any iPad with iOS 4.2 or higher. With almost 5,000 ratings, Photon users give it 4 stars which is pretty respectable for a 2.0 version. According to Appverse, Photon has been the number one paid browser in the app store for months. The interface will be very familiar to anyone who has used a web-browser in the last decade. Everything looks familiar and clean. What's different is the Lightening Bolt in the top right of the tool bar. Enter the address you want to get to, or search in the search box. Once you have arrived at a site that utilizes Flash, touch the Lightening Bolt, and Flash will be enabled. You will notice a slight decrease in display quality, and a subtle slow down in performance, but frankly less than any other Flash browser I've tried. Photon is a fully realized browser, not just a Flash enabled tool. You will get tools such as private browsing, URL toolbar that combines history and search keyword suggestions, email/Facebook sharing capability, rotation lock, brightness control, and the ability to personalize colors. Tragedy in CT. Heartfelt prayers to all involved. So, this is a bit of a departure from technology, but truly a celebration of the human spirit, ingenuity, and resilience. And at the end of the day, that is what I get excited about! I am amazed at the tonal quality the musicians get from instruments made of trash. Creating such beauty in the face of societies refuse, surely there are some powerful metaphors happening here! You can learn more about this project here, and also see them on Facebook here. Tech Ninja is glad to have Guest Blogger: Ashley Robinson once again! I have a question for all the school based related service providers and assistive technology professionals: Have you ever struggled to explain your role in a student's education to a parent or teacher? As a speech-language pathologist at a middle and high school, I see many students who have received speech-language as a related service since preschool. In many cases I wonder if the role of the related service professional has been explained to the team. So, I came up with my own explanation. 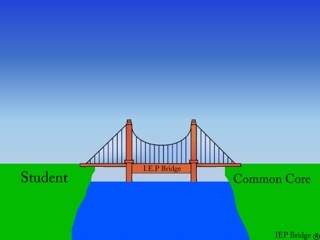 The IEP is the bridge to the curriculum. It should address the skills that the student needs so that he can follow the Common Core. For example, there is a sixth grade boy who struggles with written expression. Instead of writing a goal that states “Boy will write on grade level,” think about what is keeping this student from writing on grade level. Perhaps this student is not using complex sentences or is using ambiguous pronoun references. The IEP team will work together to review data on a child and determine the needs of a particular student. In this case (Fig. 2), the student does NOT require any related service support, so the special education teacher is the one building the bridge. Another possibility is that the team may find that a speech-language impairment is the primary disability holding the child back, and the SLP will be in charge of building that bridge. In either case, additional related service support is not needed. In my experience though, most students have a disability (think ADHD or specific learning disability) and language disorders (or sensory issues, or assistive tech issues....) are a part of that disability and require related service support to access the IEP. (Fig. 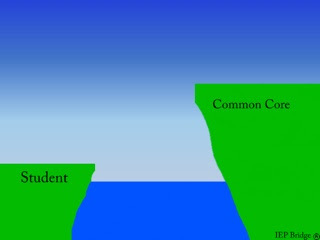 3) The bridge cannot be built straight across - there needs to be a ramp. This is how our lead SLP explained it to us, “If you take away the student's primary disability (e.g., ADHD), would they still have a language disorder?” This is a clinical judgement question for each student; however, I've found the answer to be “probably not.” Thus, speech-language is a related service. Because I'm an SLP, I am going to use speech-language services as my example; however, this analogy applies to OT, PT, and Assistive Technology (at least with the model we work under in my school system). 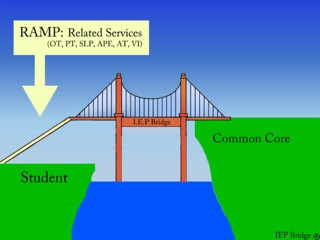 Related service is the RAMP to get on the bridge (i.e., the IEP). (Fig 4). 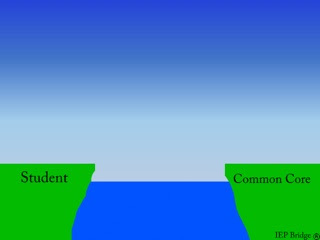 What language skills does the student require to even get on the bridge? Again, goals or objectives should be developed to address a student's language needs that are impeding him from accessing the IEP (e.g., explicit instruction in pronoun use or sentence construction). Once the student has mastered these skills, and is on the bridge, then the special education teacher is the one to continue moving forward to build the bridge. 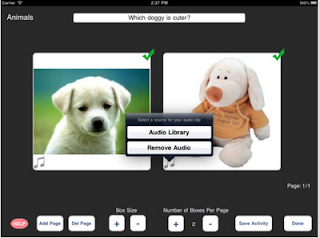 Speech-language services are no longer necessary. Goals should address the needs of the student, and with each year the student will (hopefully) close the gap until he is working on the curriculum (YAY!!!). Some students will never have a bridge that stretches all of the way across; however, it is important that goals are systematic and are bringing that student as far as possible each year. I'm curious to know what you think. How do you see the role of the related service professional in the school? Feel free to contact me with your thoughts and questions! ChoiceBoard Creator by Techno Chipmunk is a really terrific iPad app for creating customizable choice boards for the unique needs of individuals with communication challenges. It reinforces correct choice by expanding the selected image as well as playing the customized auditory rewards. 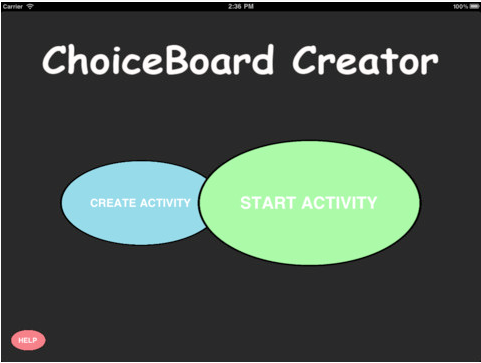 Think of it as a streamlined "ChooseIt Maker 2". Granted, not near the bells and whistles, but much easier to setup, and FREE. It is an excellent tool to train and prepare users for more sophisticated communication devices via an easy, simple-to-use choice-making platform. The possibilities are limited by your creativity. •Present vocabulary, sight words, shapes, numbers, or alphabets in array of boxes and ask your child to find the right one. 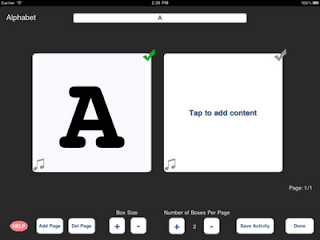 I'd love to hear how others are using this app with their students.